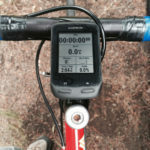 Several years ago I saw that Garmin had come out with a smaller, simpler bike computer, the Edge 500, that contained most of the features that I, as a data interested cyclist but not data driven professional or geek, would really like. The computer I was then using had much of the data I desired, but the Garmin had all the advantages that a GPS based unit would have, not the least of which was that it did not require a wheel sensor or magnet to clutter up the bike. So I bought it, and I loved it. In 2013, Garmin came out with a newer version, the Edge 510. I have been using this unit for nearly a year, and I love it even more. First, it has all the features that the Edge 500 has, which is far more than most of us will ever use. Trip miles, total miles, average and max speed, average and max heart rate, lap data, training zones, elevation and total elevation ascent and descent, temperature, time of day, slope and many more features too numerous to list. Also, both devices connect to your computer so you can upload your data to Garmin’s program (Garmin Connect) or a third party program such as Strava. The fact is, both the 500 and the 510 are more like a menu than a total program: You pick and choose the features that are important or interesting to you, and you have a large selection to choose from. But there are some key differences. First, the Edge 510 has a little bit bigger display while still being a nice, compact unit. While this is not a major issue for many, it is for me. I prefer to keep my bicycles sleek and uncluttered, and a more compact bike computer helps with that particular obsession. Additionally, it has a touch screen which makes it much more user friendly. And, unlike the 500, it is a color screen. Plus, you can cycle between 5 different data screens, and have up to 10 different sets of data on each screen. That’s up to 50 different data items on your bike computer. I don’t use nearly that many, and some data will appear in a larger font (takes up more area on the screen) if you put less data on the screen. This is useful for older and/or impaired eyes. Also, there are a couple of data items that I like to have on 2 different screens because I always want that particular data immediately available. The fact is, you have options galore, and the touch screen allows you to more easily configure the Edge 510 and to scroll through it when reviewing your data either during or after your ride. One thing that bothered me with my Edge 500 was reviewing data from previous rides. If I wanted to review data on the computer from a previous ride, I needed to scroll backwards from the latest ride to the one I was searching for, and that could take quite awhile. With the Edge 510, you can quickly locate a previous ride and review that data. As I like to manually keep some of my data on a spreadsheet, this was very laborious with the Edge 500 if I was several days or even weeks behind on my record keeping, but is a breeze with the Edge 510. Of course, if you use Garmin Connect or some other program, it is very easy. But these don’t always show some data the way I want it, so I like the quick access to previous rides available on the Edge 510 so I can keep my own spreadsheet. Plus, I am not much of an on-line data user and frankly have not utilized these programs much. I intend to explore these more in the future and, who knows, may become more of a convert to their use. But for the time being, I will continue to manually transfer the data I am most interested in to a spreadsheet so I can manipulate it and print it for my purposes. Bottom line, I absolutely love this computer, despite the fact I am certainly not utilizing it nearly as much as even I would find useful and interesting. It does what I want, it does it efficiently, and it does it in a very use friendly way. I would give it the highest possible rating except for the fact that it does not offer everything that some of the larger and pricier models offer. But then, it is not designed to do so. My rating (using a Category 4 – HC rating system): Category 1 (4 stars).